Get a close-up view and the story behind classic boats and collector cars at Oswego Heritage Council’s 18th Annual Show August 26-27. ●The arrival of the world’s only operating PT boat at 10:00 a.m. on Saturday kicks things off at Foothills Park offering visitors on-board tours throughout the day as well as Sunday. Other unique land and sea classics will also be on display. ●New this year is a Poker Run Car Tour to benefit the scholarships in the Dr. Quinton-Cox Memorial and the Lake Oswego Veterans Memorial fund. The tour will take participants to five historic locations beginning at Foothills Park at 11:00 a.m. on Saturday, August 26, culminating with a barbecue at 2:00 p.m. For a $5 donation, participants will receive two playing cards which they can then add to at $1 per card along the way. By the tour’s end, the players holding the three best poker hands will win baskets holding more than $100 worth of prizes. Additional recognition will be given in categories such as Farthest Traveled, Most Unique Co-Pilot, Most Unique Vehicle. ●Lions Club pancake breakfast will be kicking things off on Sunday, August 27 at 7:30 a.m. at George Rogers Park followed up with lunch beginning at 11:00 a.m.
●Collector cars will start lining up in George Rogers Park on Sunday morning and be on display from 9:00 a.m. to 3:00 p.m. This year’s headliner car is the Austin-Healey so be on the lookout for a good representation of them. ●Nearly 40 classic boats will be docked at Sundeleaf Plaza for close-up viewing offering examples of rare as well as wooden masterpieces. They all come with a story which owners are more than happy to share. Stay tuned for what’s happening in Lake Oswego. Click the “Sign me up” button in the top right hand column and receive weekly updates of “52 Reasons to Love Lake Oswego” in your inbox. 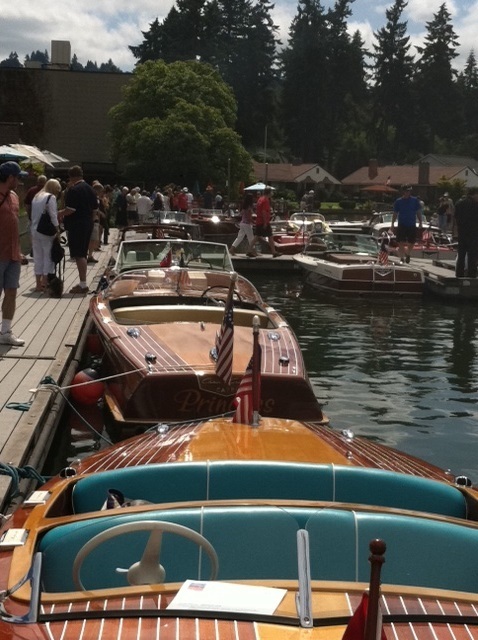 This entry was posted in Things to Do in Lake Oswego and tagged Lake Oswego Oregon, Oswego Heritage Council, Oswego Heritage COuncil 18th Annual Collector Car and Classic Boat Show. Bookmark the permalink.